Can you name the head coach of the Hawks? I hope so. Can you name the assistant coaches? Maybe not. Here, you can find information about the men behind the players. Who is the man called Larry Drew? When Larry Drew was named head coach of the Atlanta Hawks last season, the majority of us really didn’t know anything about him other than he was an assistant coach under Mike Woodson. After watching and listening to him for a full season, we now know LD a little better. Please allow me to help you get to know head coach Larry Drew a lot better. Larry Donnell Drew entered the world on April 2, 1958 in Kansas City, Kansas. He played four years at the University of Missouri as a point guard listed at 6’1”. As a Mizzou Tiger he averaged 12 points and 2,8 rebounds. In just his sophomore season, he helped lead the Tigers to a Big Eight Tournament championship. In 1979, he was Mizzou’s leading scorer. During his junior and senior seasons he won MU’s Sparky Stalcup Award for inspiring leadership as well as the MVP award. In 1993, Larry Drew was inducted into the University of Missouri’s Intercollegiate Athletics Hall of Fame. Not only was he the only Tiger to lead the team in assists for three consecutive years but he also set a school record by having 12 assists in the impressive upset of Notre Dame in the 1980 NCAA Tournament. On the seventeenth pick of the 1980 NBA Draft, Larry Drew was selected by the Detroit Pistons. He went on to play for the Kansas City/Sacramento Kings, and the Los Angeles Clippers before leaving the NBA to play for Scavolini in the Italian League. 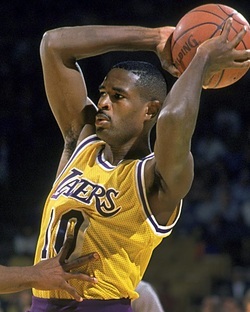 Larry Drew returned to the NBA the next season to play for the Los Angeles Lakers where he would retire the following year. During his ten year NBA career, he averaged 11 points, 1 rebound, and 5 assists per game and entered the postseason four times. His peak season came during his third year in the league during which he averaged 20 points, 8 assists, and 1 steal per game. Upon retiring from the NBA, Drew took over as head of the Magic Johnson Foundation before climbing aboard the coaching carousel by becoming an assistant coach for the Lakers in 1992. After this stint with the Lakers, he fulfilled the same job with the Detroit Pistons, Washington Wizards, and the New Jersey Nets before landing in Atlanta in 2004. 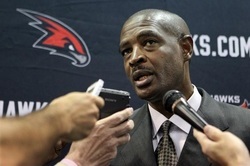 Larry Drew joined the Atlanta Hawks shortly after Mike Woodson was hired as head coach. Not known to many, these two crossed each other paths numerous times through their careers. They met back in 1980 during their respective senior seasons in college at the Aloha Hawaii Classic. Following a practice at a later time, Jack McCloskey, who was general manager for the Detroit Pistons at that time, requested to speak to both Larry Drew and Mike Woodson. This was the first meeting off the court between the two men. Upon entering the NBA, Woodson was drafted 12th by the New York Knicks while Drew was selected 17th by the Detroit Pistons. Eventually they both ended up being traded to the Kansas City Kings who are now the Sacramento Kings. A couple years later, they were both included in a package deal that sent them to the Los Angeles Clippers where this particular team would average 114 points per game. The two developed such a friendship that Woodson made the decision to add Drew to his coaching staff in 2004. Drew remained an assistant coach under Mike Woodson from that point until June 12, 2010 when he was announced as the new head coach for the Hawks. Off the court, Larry Drew enjoys spending time with his wife Sharon and their three children: Larry, Landon, and Lindsey. Larry Drew II is a senior currently playing for UCLA while Landon and Lindsey play high school basketball in Los Angeles. During the summer Larry Drew hosts the Larry Drew Advanced Guard Academy in Los Angeles to develop young point guards. He also holds various camps throughout the summer. Larry Drew managed to turn some heads and distinguish himself from his predecessor Mike Woodson during his head coaching debut. He guided the Hawks through plenty of hills and valleys to the second round of the playoffs. We can only assume that Larry Drew has more plans for this team and more goals to be met. I’m sure we will learn much more about the man called Larry Drew throughout his tenure as head coach of our Atlanta Hawks.